The chancel choir at First Congregational Church of Anchorage is a friendly and welcoming group of singers that rehearses Wednesday evenings from 6:30-8:00 pm. We sing in the 10:30 am Sunday Morning service September through the first Sunday of June. Sunday rehearsal is from 9:30-10:00 am. If you enjoy singing and being part of a joyful musical ministry, this is the group for you. We welcome all parts (SATB) and perform many styles of music. Lori Parker Wasko and her husband Paul moved here from Minnesota in 2014. Lori has extensive background with children’s choirs and intergenerational musical theater. Lori is studying Early Childhood Education at UAA. Lori leads the choir with wonderful and creative music. 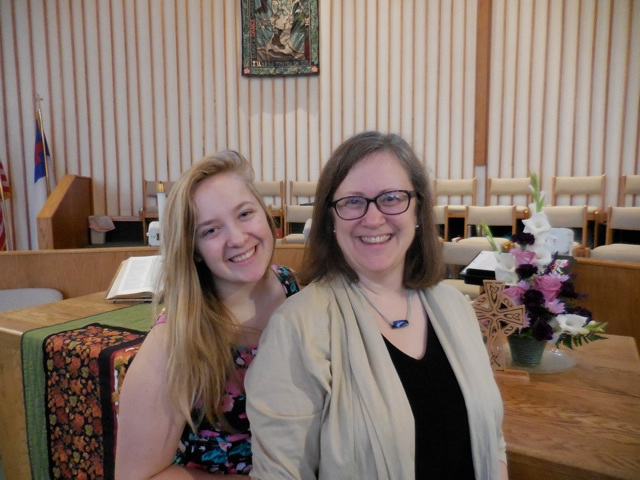 (photo: Lori and her daughter Emma, also a student at UAA and choir member). The handbell choir meets September through June at 5:15 pm Wednesdays before chancel choir rehearsal, and performs monthly during worship services and other church celebrations, plus occasional solo/ensemble pieces. We always welcome more ringers, and would love to teach you to ring! We have a lot of fun! Prior musical experience is not required. Caroline Valentine is our leader and we are a member of Handbell Musicians of America (formerly American Guild of English Handbell Ringers). 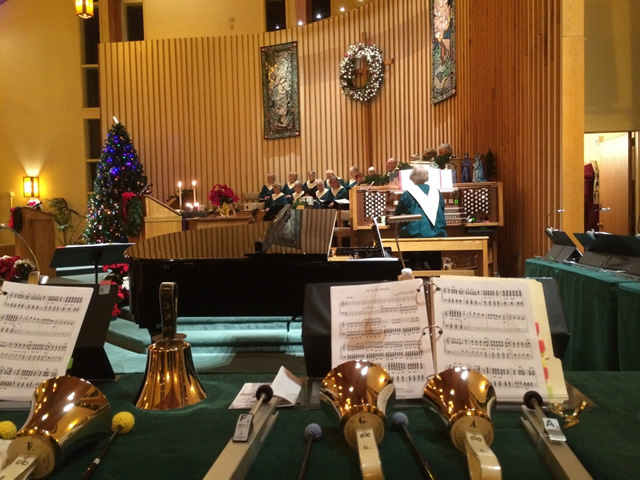 We use Malmark handbells.